Last Monday, May 21, Micron introduced the industry’s first QLC SSD for enterprise applications. Micron’s press release is HERE. Although this is a laudatory feat, the industry has been headed in this direction for a number of years. In fact, this was the subject of a presentation that I made to the Storage Networking Industry Association (SNIA) during its Winter Symposium in January 2014. The slide in which I discussed this appears as this post’s graphic. (Click on it to see a larger rendition.) 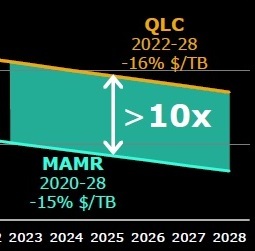 This table attempted to illustrate that all SSDs were headed towards TLC (and implicitly QLC) over the long term despite the fact that naysayers persistently argued that this could never happen. It looks at attitudes over history and considers the fact that things that the industry said could “Never” happen ended up eventually becoming the mainstream technology. Those who have been reading posts on The SSD Guy blog for some time have often heard me explain that SSD prices will not fall below HDD prices anytime soon. 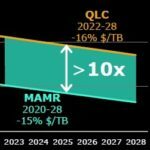 Last week Western Digital shared a roadmap that shows that we can expect for there to be a sizeable price gap between the two technologies at least through 2028. Let me stop for a moment to point out that Western Digital Corp, or WDC, no longer has any reason to take sides in the HDD vs. SSD battle now that the company has acquired SanDisk, a leading SSD maker. Even before that, WDC’s HGST business has been the market leader in SAS SSDs for a number of years. 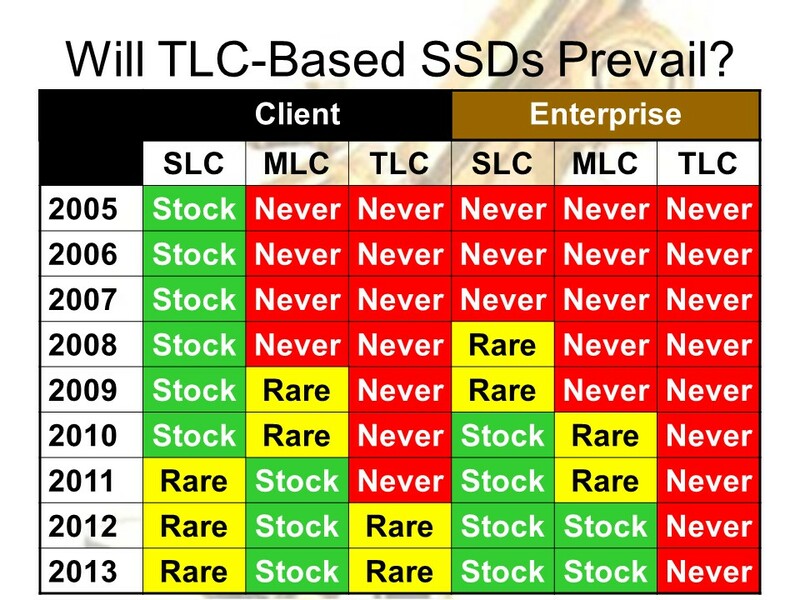 WDC doesn’t take sides in arguments about SSDs vs. HDDs. Instead the company stands ready to sell whichever one the customer finally decides to use.